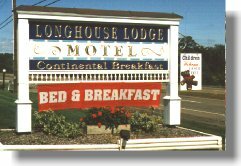 The Longhouse Lodge Motel and Manor are situated on a hill overlooking Seneca Lake, the deepest of the Finger Lakes, in upstate New York. 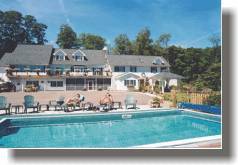 The Motel is situated right off State Route 14 just north of Watkins Glen and is a great place to stop for a night or make your "base of operations" while you enjoy the many excellent sites and attractions of the area. Each room has a king or 2 double beds, Cable TV, phone, individual heat/air conditioning controls, VCR (free movies from our large collection), and refrigerators. Deluxe rooms have microwave ovens. All our spacious rooms include a large complimentary continental breakfast. Only 2 miles away from Watkins Glen and its shops, excellent restaurants and attractions. Check our local information page for more details on these and many other points of interest.